Today I had the opportunity to participate in a Skype lecture with a group of Senior English students and a Ph.D. student from Virginia Commonwealth University. The students were engaged. Yes, I said it! These Senior English students with just a few days left in high school were engaged! The lecture was about identity and the book Invisible Man. The lecture and the conversations were great. The students were asking engaging questions and walked out of class excited about the lecture and wanted to do it again. 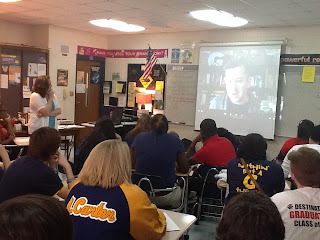 The students would have never had this opportunity without the use of a free online tool - Skype. With the use of Skype, students are not able to experience the world that exists beyond the four walls of the classroom. So how do you get started? First, download Skype and create an account. If you have a personal account, you can use that or create an educational account. The next thing you need to do is find someone to Skype. Easy enough, right? Yes! There are resources out there to help educators find professional and other educators to Skype with. This website should be your first stop when looking for Skyping experiences. On this site, you can other educators and professionals that want to Skype and gain that experience of learning beyond the four walls. This website provides a list of authors that you can contact for a Skype lesson. Keep in mind, you won't find famous authors (no offense) on this list. You will find up and coming authors and authors the students may not know .. yet. If you want to Skype with a current author, be ready to write a check in most cases. This is another list of authors that will Skype with your students. If you are a secondary teacher, try talking with the local or not so local university to find a professor or graduate student that would Skype with your class. This will help bring your subject area more to life for the students. What resources do you use to find Skype activities?